You're a truck. We get it. Value-minded buyers should stick with the four-cylinder GMC Terrain SLE. Denali versions are plush and luxurious, but can easily blow through $40,000, where they run into the seven-seat Acadia. The 2013 GMC Terrain may wear a tough skin, but shows a softer side with excellent four-cylinder gas mileage and Denali luxury. The 2013 GMC Terrain has gone from a quiet addition to legitimately popular choice in the GMC lineup, which isn't surprising as demand for fuel-efficient crossovers climbs across the industry. The very nearly mid-size Terrain utility vehicle is a good reason why--it's a chunky piece of work that gives up nothing in refinement, gas mileage, or features to crossovers like the Edge, Venza, and CR-V. 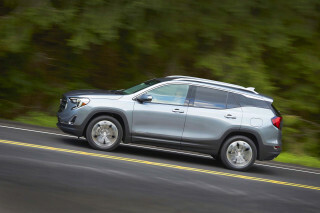 The five-passenger GMC Terrain is a close relative of the Chevy Equinox, and the two have some great attributes in common--very good fuel economy in some versions, a spacious interior, and thoughtful touches and features. The Terrain doesn't look a bit like its companion piece, though--it's more a latter-day HUMMER than even its own brand's trucks and other sport-utes. It's a hard-nosed look, striking from some angles, and more a Tonka novelty from others, especially at its overly boxy fenders. The cockpit is styled much more in the contemporary GM vein. There's a shield-shaped set of controls to the right of the driver, a grouping that looks like the same unit in the Chevy Cruze sedan. It's framed in low-gloss metallic trim, and capped by a hood that protects the standard 7-inch touchscreen from direct sunlight. With just the right amount of blocky detailing, the Terrain's cabin is more in tune with the tasteful looks of the larger Acadia, especially in Denali trim, which wears some woodgrain on the steering wheel, red stitching and soft padding on the dash, and standard leather on the seats. The Terrain has more in common with the Equinox under its sheetmetal--namely, its drivetrains and most of its other driving hardware. 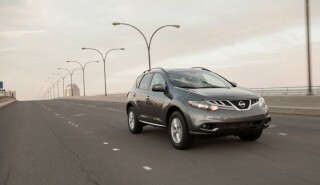 The base Terrain sports a 2.4-liter four-cylinder engine outfitted with direct injection. It turns in 180 horsepower and EPA fuel economy of 22/32 mpg in front-drive models, a mile per gallon less on each side when all-wheel drive is fitted. Any Terrain can be upgraded to a new 301-hp, 3.6-liter direct-injected V-6 that replaces the old 3.0-liter six, but earns the same 17/24-mpg gas mileage (or 16/23 mpg iwth AWD). Both engines are teamed to a six-speed automatic, which is refined most of the time, with only an occasional judder under quick power changes. Dig deeply into the four-cylinder's powerband, and you'll probably find it has plenty of urge for almost every need; the V-6 is necessary only if you're always filling all the Terrain's seats, or maxing out the six-cylinder's 3500-pound towing capacity. Front-wheel drive is standard, with all-wheel drive an option. Excellent safety scores are part of the Terrain profile. The NHTSA gives it four stars overall, while the IIHS calls it a Top Safety Pick. Along with curtain airbags and stability control, a rearview camera is standard--and necessary, since the Terrain's styling creates big blind spots. Denali models have standard blind-spot monitors with cross-traffic alerts. 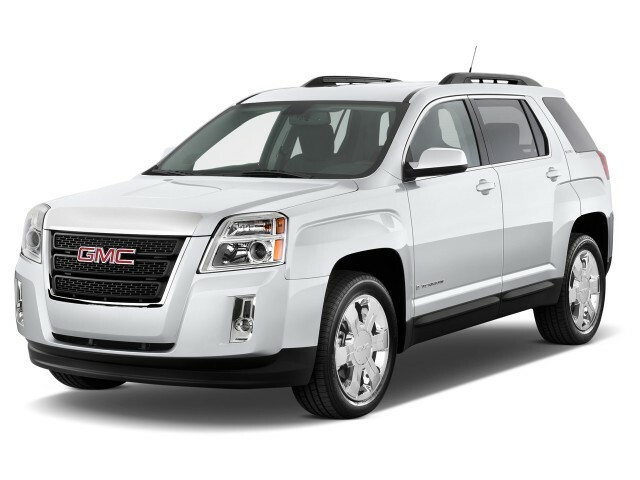 The 2013 GMC Terrain is square-shouldered on the outside, a little softer on the inside; Denalis have a few plush touches. Brutalism is an art form that came and went quickly, but left a deep crater in cityscapes. Look around at the concrete wonders of the 1970s and you'll see the same regular, angular forms repeated in the GMC Terrain, the most brutalist SUV ever save for one. That one? The GM HUMMER, the direct styling ancestor of the Terrain. The GMC's just barely out-boxed by that now-dead ute, and it's just a D-cell battery short of the full Transformer look that had a grip on GM design for much of the past five years, on vehicles as oddly linked by it as the Spark, the Sonic, and this crossover. The Terrain just has no time for the politely softened curve or bowed line. It doesn't sit upright--it stands bolt upright, at attention. 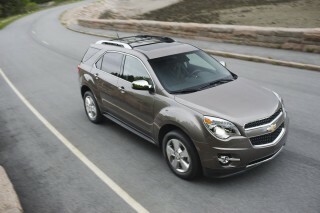 The fenders block and tackle their way into sight, obliterating the otherwise obvious links to the Chevy Equinox. Polarizing? Yep, as much as the HUMMER was, though the Terrain doesn't seem to have suffered from inheriting that quasi-military design language. While the Terrain's exterior is a little more distinctive and macho than the Chevrolet Equinox, along with most other compact crossovers, its instrument panel is much like that of the Chevy: a somewhat V-shaped center stack, housing audio and climate controls, and flanked by large vertically oriented vents, is the center point of the design, and otherwise details and trim look chunky, with the same cloudy metallic surfaces that are now used inside other GMC vehicles. The new Denali edition mutes the look very indirectly. The grille is mesh; the metallic trim is satin in texture. The cabin wears a soft pad on the dash, stitched with red thread, and the steering wheel has a section of dark woodgrain implanted across a top arc. Denali badges and a unique color palette are the only other details that separate it from the rank and file. 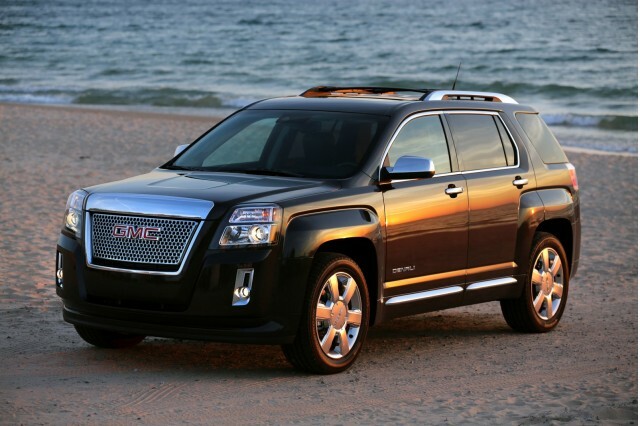 The 2013 GMC Terrain has a frugal four or a very strong V-6; the ride's more comfortable now, thanks to better tuning. Midway through its life cycle, the GMC Terrain gets a new V-6 engine in the 2013 model year, and it's a big leap forward in horsepower and refinement. It also gives shoppers a much clearer choice between the six and the standard four-cylinder--which can be ordered on any Terrain, whether it's an SLE, SLT, or even a Denali. 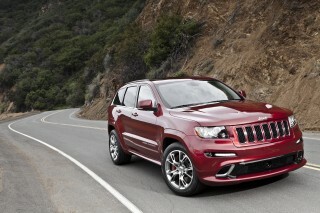 The four-cylinder is a 2.4-liter, with direct injection and active noise cancellation. In the Terrain, it puts out 180 horsepower, and mates with a six-speed automatic transmission, one with a sport-shift mode that toggles through gears via a lever-mounted rocker switch. The four-cylinder isn't a blazing performer, and it's not meant to be, but it is refined enough, and quick enough, to be a strongly recommended powertrain. It's ideally suited to the kind of driving most owners will put it through on a daily basis, even if it's occasionally laden down with extra cargo and more passengers, where the somewhat thin low-end torque will make itself known. In times like those, drivers will know after experimenting, not to engage Eco mode--where the Terrain's automatic slows down its shifts and lowers its torque-converter lockup speed, injecting more sluggishness into the effort. The upgraded V-6 engine replaces last year's 264-horsepower, 3.0-liter six with the same 3.6-liter, 301-hp V-6 that's found in the seven-seat Acadia. With the same six-speed automatic, it's a terrifically quick engine, with just as much or more engine noise--only, it's not an unexciting drone, but a muscular burble backed up by 0-60 mph times in the 6.5-second range. That's somewhere in base BMW X3 territory, and so is the Terrain's top tow rating of 3,500 pounds (or 1,500 pounds with the four-cylinder). Even with the ratcheted-up power, this engine still gets the same gas mileage as the old six. All Terrains get new dual-flow shocks this year; the dampers use oil under pressure to mute road impacts, and promise better firmness on smooth pavement and more supple behavior on awful stretches of road. Luckily, we had last year's Terrain on hand, and can attest to the improvement, at least over the bad roads: the fractured feel and harsh bottoming-out of the '12 Terrain in some circumstances was nicely rounded off by the new model. 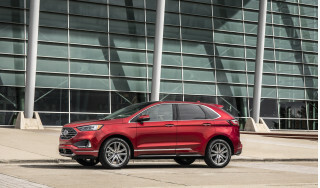 It's now much more competitive with vehicles like the Ford Edge, where ride quality has been less of a concern. It's worth noting, for bargain shoppers, that only the Chevy Equinox LTZ V-6 gets those uprated shocks. The Terrain can carry five adults easily, and the sliding seat gives it more flexibility than other utes in its class. It's a compact, borderline mid-size crossover, so the diehard family haulers who absolutely have to have seven seats just won't be satisfied with the five-seat Terrain. It's still a great choice for ferrying kids and adults, and does a better job at both than some of the smaller competition, thanks in part to a flexible, sliding second-row seat. The ample room inside the Terrain makes itself known right away. 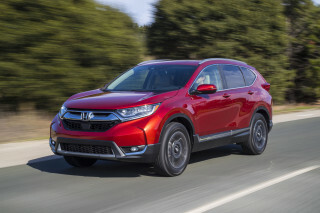 Climb into the driver's seat, and the mildly bolstered buckets surround you with a half-foot of head room, even with the sunroof that's standard on most trim levels. Knee room is good, too, even with the Terrain's wide center console, and the Terrain has a power driver seat and tilt/telescoping steering for most drivers to find a good position behind the wheel. The Terrain shines in its second row, where the bench seat does a nifty trick possible only because of the upsized interior. The back seat slides back and forth on an eight-inch track, flexing its utility muscle between cargo space and leg room. With the seat moved as far forward as possible, there's 31.6 cubic feet of stowage; by flipping it forward entirely, the Terrain has nearly 64 cubic feet of cargo space. That said, it's slightly less easy to load the Terrain with cargo. The load floor is a little high, and the back seats don't fold completely flat. High crash-test scores and standard features like a rearview camera easily overcome the Terrain's iffy rearward visibility. Again for the 2013 model year, the GMC Terrain adds safety gear to complement its strong crash-test scores. On the testing front, the Terrain is one of the best-scoring crossovers on sale today. The Insurance Institute for Highway Safety (IIHS) rates the Terrain as "good" in all its tests; together with standard stability control, that makes the ute a Top Safety Pick. Meanwhile, the National Highway Traffic Safety Administration (NHTSA) puts the Terrain at an overall score of four stars. Individual tests give it four stars for frontal impacts and five stars for side-impact protection and for recently added (but not yet included in scoring) side-pole test. Every Terrain comes with the requisite safety features, including dual front, side, and curtain airbags; and anti-lock brakes, traction and stability control. In the 2012 model year, GMC made a rearview camera standard on the Terrain, when it added a larger LCD screen that duals as a display for its Intellilink connectivity system. It's a good feature to have, since the upright, chunky styling gives the Terrain many blind spots, and since its rear-seat headrests are fixed--they can't be folded down or removed to improve rearward visibility. GMC also offers rear parking sensors as an option, which we'd also recommend. A new lane-departure warning system and forward-collision alert have been added to the options list as well, and they're standard on the new Denali package, which also gets a distinct safety feature unavailable on other models--blind-spot monitors with cross-traffic alerts, which sound the warning when cars or other obstacles move across lanes behind the driver into possible blind spots. All Terrains have advanced infotainment gear and streaming audio; navigation is an inexpensive upgrade. GMC is the premium truck brand in the General Motors portfolio, so its Terrain is packaged with more standard equipment and features than the similar Chevy Equinox. There are three Terrain models--the SLE, SLT, and Denali. On the base SLE, the Terrain stocks standard power windows, locks, and mirrors; air conditioning; fog lamps; a power driver seat; a rearview camera; ambient lighting; and an AM/FM/CD/XM audio system with three months of service and a USB port for media players; a power driver seat; tilt/telescoping steering; ambient lighting; and a rearview camera. GMC's Intellilink connectivity suite is also standard now, too. It connects smartphones to the car's Bluetooth, steering-wheel controls, and LCD touchscreen, so that mobile apps like Pandora and Stitcher can be driven through the car's controls, not the phone's. Intellilink also runs the audio and phone systems, and can control the $795 navigation system via voice commands too, when that option is ordered. As part of its program of running upgrades, GMC has updated Intellilink to port in contact addresses along with telephone numbers, so navigating to a friend's house by voice just became a little easier. Intellilink also has standard Bluetooth streaming audio, and we've had some occasional run-ins with it and with our Apple iPhones and extended-battery-life cases. Mostly, we've experienced lag in the detection of music titles and album cover art, which lingers through several songs, though occasionally the forwarding controls stopped working until we switched to another media and back into Bluetooth streaming again. As with any smartphone, it pays to test your current phone with a new vehicle and its infotainment system before you buy. Gas mileage is a big draw in the four-cylinder Terrain; the new V-6 doesn't fall back in fuel economy, either. 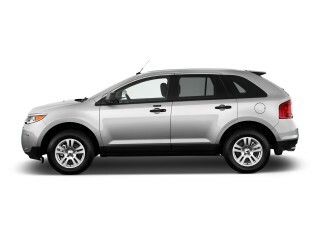 New in the 2010 model year, the compact Terrain crossover is its only vehicle that offers a four-cylinder engine. That version of the Terrain gets the best gas mileage of any vehicle in the entire GMC lineup. The 2.4-liter four-cylinder engine that shows up in any version of the Terrain--from SLE to SLT or Denali, if the driver wants--has a raft of gas-saving technology that makes it a miser, especially in its size class. 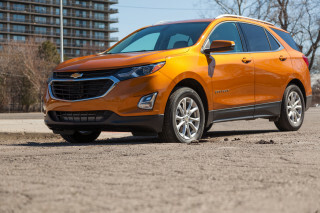 Features like direct injection help the four-cylinder achieve an EPA-estimated 22/32 mpg, a figure better than all the other mid-size crossovers except its corporate cousin, the Chevy Equinox. Adding the Terrain's available all-wheel-drive system doesn't ding fuel economy too badly: it still is rated at 20/29 mpg. Eco-geeks will be thrilled to learn the Terrain four-cylinder models also have an 'Eco' button which, when engaged, causes accessories like the air conditioning compressor to be a little more conservative, has the torque converter lock up a little earlier, and makes the transmission a little more reluctant to downshift. One of the best cars I have had. Best vehicle ever owned ! 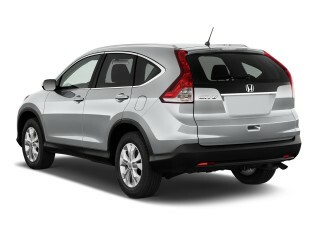 I am still amazed at the gas mileage this SUV gets, looks great, drives great, I just love it ! Good car - Roomy. Great ride very comfortable especially on long trips. Good power. Like the way just back opens with push of button. Bluetooth is great. All programming is hands free.